The Path To Agility is a milestone based, delivery driven methodology with templates, training, and how-to tools designed to minimize risk and resources for banks and Finxact’s system integration partners. Qualified banks can start today by requesting a Sandbox at no charge. Qualified banks will receive an email with your own private credentials. Finxact’s Open Core API Specification (Swagger 3.0 Spec). Reference configuration and pre-configured templates for customizing and testing products, accounts, GL accounts, transaction, and orders. The Path To Agility Guide – with instructions, examples, and test modules describing how to use, configure and extend Finxact’s Core as a Service in test and production. Start by defining your objectives. If starting with a pilot, perhaps your roadmap includes iterative POCs or milestones that may include the creation of customized products or integration with an in-house test system. Example milestones may include a mobile only high yield savings account which you may look to target out of state customers. A more ambitious example may be a high yield ladder CD account targeted at small businesses tax savings accounts, or consumer savings goals. As rates rise, this product is sure to become popular. Whatever your milestones and end objective, your sandbox allows you to exercise all of Finxact’s Open Core APIs, its pre-integrated partners, the Finxact Core Servicing platform for servicing your test accounts, Finxact’s Bank Architect to configure products, and the Finxact Console for managing the entire environment. At this point, you will make a strategic decision. Is your objective to convert your legacy operations in the near term, or is your objective to create a stand alone new initiative to acquire new customers. Alternatively, you objective may be a hybrid of both meaning you want a platform for acquiring new customers in the near-term with the goal of migrating legacy customers and operations to the new platform over time. 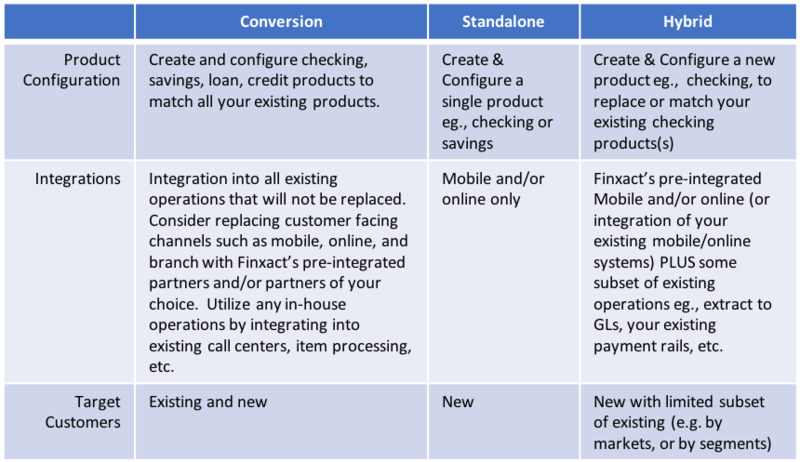 While Finxact’s Core as a Service is the same regardless of your use case, the specific integrations and configuration will differ depending on your end goal. Following are some example scenarios. 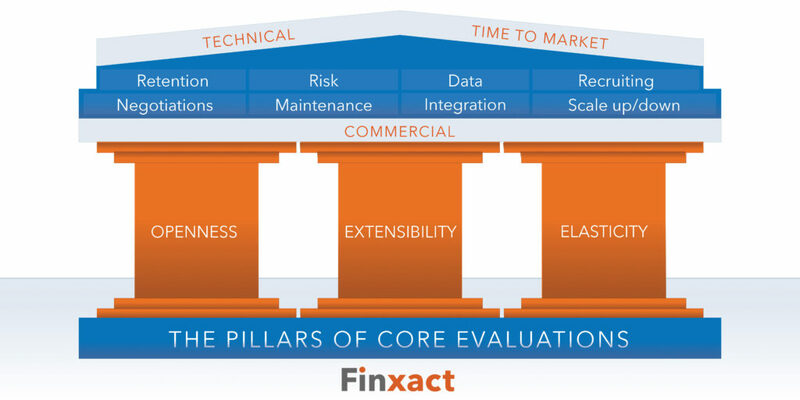 Using Finxact’s Path to Agility methodology with your in-house team or alongside Finxact’s integration partners, you will be using the actual, live, Finxact Core as a Service, building the foundation of your new core, supporting your near term and long term objectives. Finxact’s Core as a Service is technically and commercially elastic meaning you can launch with very niche markets with minimal risk and cost. As you launch with new innovative features, new products, new functionality, and in new markets – Finxact will scale with you. You decide how, when, and who… without restraint. The efficiencies of not having to reconcile offline systems, maintain a complex IT stack, manage upgrades, or fix technical debt will free you to focus on innovation. Innovation that drives growth.